What does it cost to attend? It is FREE to attend and open to all ages – bring the family and have an awesome day with us! Is the food free as well? NO, food and drinks will be available for PURCHASE at the event from various food and drink vendors. When does the event open to the public? 11am Saturday, September 21, 2019 and closes at 7pm the same day. What kinds of food can I expect to find at the event? All kinds of food ranging from sweets to smoked and everything in between. 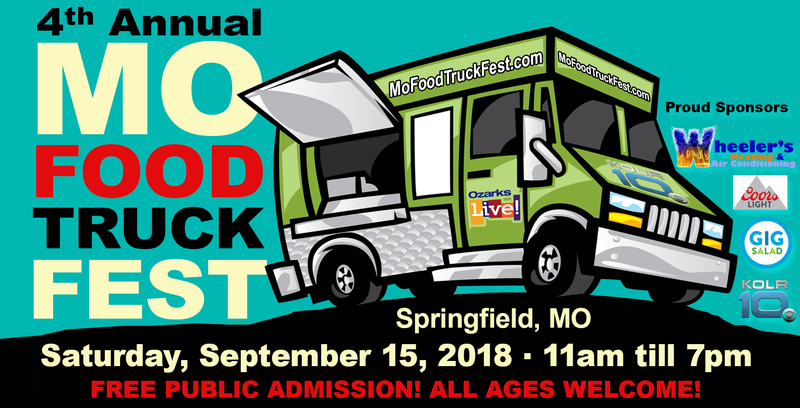 Visit the TRUCK tab to see who all is scheduled to be at the 5th Annual MO Food Truck Fest. How long will it take to get food from a food truck? Remember that each truck has 2 to 3 folks working inside. It will take longer than a “normal drive thru” to get your order – more along the lines of a “sit down” style restaurant. Please understand there is a possibility of long lines and slower than normal service from the food trucks because of the large amount of folks who have expressed interest in attending the event. Will there be entertainment at the event? Yes we will have live music for you to enjoy on the stage. Can I bring a cooler? Sorry, but NO outside food or drinks allowed. Can I bring my pet? NO – Service animals ONLY. Can I bring my lawn chairs/blankets? YES, the facility has NO seating so we encourage you to bring your blanket or a chair and enjoy the day with us. Where is parking? In the parking garage next to the event or any of the designated parking lots/spots downtown. Will there be an ATM on site? NO, so bring cash as some of the food trucks may not take debit cards.